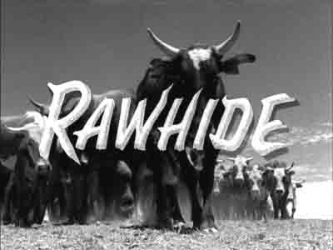 Rawhide is an American Western series that aired for eight seasons on the CBS network on Friday nights, from January 9, 1959 to September 3, 1965, before moving to Tuesday nights from September 14, 1965 until January 4, 1966, with a total of 217 black-and-white episodes. Starring Eric Fleming and Clint Eastwood, the series was produced and sometimes directed by Charles Marquis Warren who also produced early episodes of Gunsmoke. Set in the 1860s, Rawhide portrays the challenges faced by the men of a cattle drive. There are 20-25 riders looking after 3,000 head of cattle. Gil (short for Gilbert Favor, episode 181) revealed this is about the maximum manageable size for a herd of cows. The cattle drive begins in San Antonio, Texas, and makes its way along the Sedalia Trail (Sedalia, the final destination, is in Missouri about 50 miles east from Kansas City). In later seasons Favor and crew push the cattle up the newer Chisum trail rather than the Sedalia Trail. The herd is estimated to be worth about $50,000–60,000 (about 1.3 million in 2010 dollars) if sold at market and represents a pool of cattle from approximately 200 owners. The trail boss carries a considerable sum of cash for all necessities and all possible emergencies. Pay was a dollar a day and "all you can eat" for the drovers. Riding drag was often a punishment since it was behind the herd, so a rider would pick up all of the herd's dust. Drives had a remuda, a pool of extra horses. If something happened to a man's horse, he would be useless without an instant replacement. Usually the episode would be introduced by Gil Favor but sometimes by others. The typical Rawhide story involved drovers, portrayed by Eric Fleming (trail boss Gil Favor) and Clint Eastwood (ramrod Rowdy Yates), coming upon people on the trail and getting drawn into solving whatever problem they presented or were confronting. Sometimes one of the members of the cattle drive or some of the others would venture into a nearby town and encounter some trouble from which they needed to be rescued. Rowdy Yates was young and at times impetuous in the earliest episodes and Favor had to keep a tight rein on him. Favor was a savvy and strong leader who always played "square" with his fellow men. He was a tough customer who could handle the challenges and get the job done. (Producer Charles Warren called on the diary written in 1866 by trail boss George C. Duffield to shape the character of Favor). Although Favor had the respect and loyalty of the men who worked for him, there were a few times when people, including Yates, were insubordinate under him after working too hard or after receiving a tongue lashing. Favor had to fight at times and almost always won. Some of the stories were obviously easier in production terms but the peak form of the show was convincing and naturalistic, and sometimes brutal. Its situations could range from parched plains to anthrax, ghostly riders to wolves, cattle raiding, bandits, murderers, and so forth. A problem on such drives was the constant need for water, and the scout spent much of his time looking for it, sometimes finding water holes, even rivers had dried up. In some ways it was similar to the TV series Wagon Train, that debuted on NBC on September 18, 1957. The series was not afraid to face tough issues. Robert Culp played an ex-soldier on the drive who had become dangerously addicted to morphine. Mexican drover Jesus (pronounced hey soos) faced racism at times (from people outside of the crew). There was still anger left over from the Civil War which had ended only four years earlier, and the "Poco Tiempo" episode reveals that Rowdy's father's name was Dan, that Rowdy came from Southwestern Texas, and that he went off to war at 16 (being later held in a Union prison camp). Trail boss Favor had been a Confederate Captain in the war. 'Incident on The Edge of Madness' in season one, guest starring Lon Chaney Jr., saw Favor's old commanding officer attempting to enlist the aid of Favor and his men to start the 'New Confederacy of Panama' much to Favor's dismay, in this episode we learn that Favor and Nolan were in the Confederate forces up on Marye's Heights at the Battle of Fredericksburg, and 'felt shamed' at having to gun down so many Union soldiers. There were still Native Americans about, though often not that wild, some still wanted cattle as payment for going through their land. There were rough characters in the shows and Gil Favor was tortured by having his face held near a fire in one episode. In another, 'Incident of The Town in Terror', people thought a sick Rowdy Yates had "the plague" (anthrax) and guns were used to enforce quarantine of the cattle drovers outside the town. There were also cattle rustlers, including Commancheros.